The only thing missing from Williamsport’s explosive offense last year was a big-play running back. That is not an issue this season with Minnesota-bound Treyson Potts returning. The 2016 all-state running back rushed for 2,017 yards and 34 touchdowns two years ago when Williamsport captured the District 2-4 Class AAAAAA championship and reached the state quarterfinals. Having him back changes the dynamic of an already dangerous offense that features all-state quarterback Joe Fagnano and Williamsport receptions record holder Marcus Simmons. If the new-look offensive line can jell as the season continues and the defense improves from last season, Williamsport again could be a tough out come November. The Millionaires were two points from reaching a second straight district championship a year ago and play all three potential playoff opponents, Hazleton, Scranton and defending champion Delaware Valley, during the regular season. Williamsport plays only four home games during the regular season, but if it can earn the district’s top seed it would have the opportunity to play two home playoff games. Replacing some standouts on both sides of the ball is imperative but the defending District 4 Class AAA champions have the potential to build off last season’s success. A good core of starters returns from last season and is bolstered by a solid group of promising younger players. All-state quarterback Connor Watkins and all-state wide receiver Gerald Ross return after putting together two of the best seasons in program history while Pittsburgh-bound defensive end and all-star defensive lineman Carmen Barone headline the defense. Loyalsock must replace some excellent offensive linemen, but has good building blocks in players like Barone, Malaki Parlante, Ian Wimer and Jeffrey Hamilton. Two-time 1,000-yard running back Cole Cavanaugh graduated, but Aidan Gair has the ability to make an impact and also will try to fill a void left in the linebacking unit after two-time all-stater Hunter Webb graduated. Keep an eye on sophomore Dane Armson who could emerge as a two-way weapon and complement receivers like Jaiden Cioffi and Derek Gee. This is a team that looks primed for a big bounceback. The Green Dragons lost some hard-luck games last season and held a 17-point halftime lead against Loyalsock in the district semifinals. That was a young team ravaged by injuries. A year more experienced, Lewisburg looks especially dangerous if it can stay healthy. 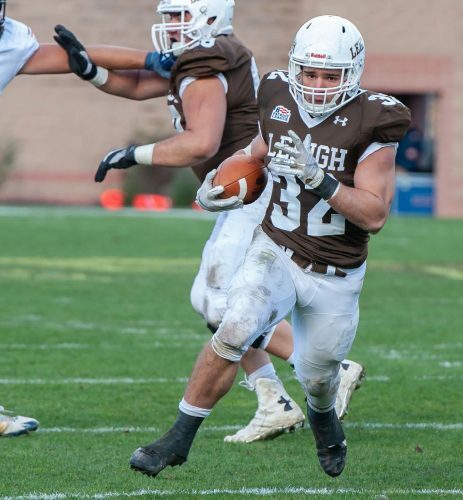 A big offensive line paves the way for a strong offense that includes two-time 1,000-yard quarterback Nick Shedleski and sophomore running back Max Moyers who ran for 1,115 yards and 12 touchdowns during his debut season. Oh yeah, all-state safety and the area’s active leader in receptions, Dylan Farronato also returns. This is an offense that can score in a variety of ways and the defense has promise as well. Linebacker Draven Doebler made 104 tackles last season and players like Ethan Spaulding and Charlie Blough could put together breakout seasons. The Dragons have a chance to make an immediate statement tonight, opening against defending District 4 Class AAAA champion Selinsgrove. This is a team that must replace the majority of its starters on both sides of the ball, but it is hard betting against a program that has been so successful the last five years. Jersey Shore has won two district championships and a league title during that time, never winning fewer than six games in a season. Having two-way starters like Sun-Gazette all-stars Kyle Tomb, David Tomb and Hunter O’Connor helps as well. Kyle Tomb is the area’s leading returning rusher, his brother David earned all-state honors at nose tackle and O’Connor is the top returning tackler a year after making 146. David Tomb and O’Connor also are part of a potentially strong offensive line. The Bulldogs have a new quarterback, but having players like Kyle Tomb and Koby Peacock (42 catches) at his disposal alleviates some pressure. Strong defense has been at the heart of Jersey Shore’s five-year run and the unit has ranked second in the area each time. That could stay the same this year, but the Bulldogs must navigate a daunting schedule that starts tonight at defending District 6 Class AAAA champion Bellefonte and continues next week at Selinsgrove. If one is looking for a team that might win a lot more games than last season, Mont-oursville might be a good choice. The Warriors return several starters on both sides of the ball from what was one of the district’s youngest teams last year. Montoursville made good strides against the district’s toughest schedule last fall, winning two straight games late and enters this season in a much better position. Montoursville learned a lot playing teams like state champion Southern Columbia, Selinsgrove, HAC-I champion Shikellamy and Mount Carmel, among others last season. That experience could especially provide beneficial this fall. The defense could be stout with leading tacklers Jaxon Dalena and Logan Balouris back. Junior quarterback Hunter Shearer helps spark the offense after topping 1,000 yards last year and there are many other exciting skill players who could make big impacts. No area team has won more games than Wellsboro (21) over the last two seasons. The Green Hornets went undefeated during the regular season each time, but face a challenge this season with many of the standouts who made that run possible no longer there. But do not weep for Wellsboro. The Hornets remain dangerous and have a good mix of returning starters and potential future stars. The defense has been the area’s top ranked the last two seasons and will remain strong with brothers Hunter and Robert Brown causing trouble up front. Keep an eye on defensive end Zach Florio as well. Two-time all-state quarterback Quinn Henry graduated, but Karter Witmer and freshman Isaac Keane are capable of doing a lot of good things. Running back Aidan Hauser is one of the NTL’s best big play threats and the junior class is fairly loaded so look for Wellsboro to remain an NTL-I title contender. This feels something like 2015 when South lost all but five starters from a district champion. The Mounties did not lose as many starters from last year’s HAC-III champion, but lost a lot, including three offensive linemen and two-time all-state running back Gideon Green. South, though, remains dangerous and could emerge as a District 4 Class A contender, competing in this class for the first time since 2015. Three-year starting quarterback A.J. Flick went over 1,000 yards last season and has good receivers like Austin Nash, Cole Lentz and Hunter Finn ad his disposal. Rion Withers and Dakota Hill return up front and Luke Winner and Gannon Guerrisky could make huge impacts in the backfield. Winner and Chris Klem are among the area’s premier linebackers and the secondary returns largely in tact. South opens the season against Montgomery tonight in what could be a playoff preview. The Panthers have reached districts for a program-record four straight seasons and could be dangerous again. Some excellent linemen and 1,000-yard running back Brendan Hill, among others, need replaced but there is a good nucleus returning. Quart-erback Brent Burleigh threw for 1,270 yards and 20 touchdowns in his first season starting, highlighting his season with an excellent performance in districts against Class AA state champion Southern Columbia. Linebacker Garrett David has made 271 tackles the last two seasons and will lead the defense. He also could make a big offensive impact after running for four touchdowns last year. One of the district’s most improved teams last season, Montgomery put together its best season since 2000 and reached its first district final since that same year. The Red Raiders are hoping that was just the start and have reason to believe they can build off that success. Montgomery returns several starters from last year and also has had much larger JV and junior high numbers the last two seasons, something that could make quite a difference to the varsity this fall. Running back Hunter Budman returns following a terrific 2017 campaign as does three-year starting quarterback Brayden Strouse who topped 1,000 yards last season. The line also could be strong on both sides of the ball and linebacker Rhyle Strausbaugh has all-state potential. Montgomery opens its season with two big games against fellow Class A title contenders South and Canton. The Defenders won two of their last three games in 2017 and are hoping that momentum carries over to this season. Warrior Run must replace two-time 1,000-yard quarterback Gage Anzulavich but has some exciting playmakers like wide receiver Riley Daubert and tight end/wide receiver Ahmahd Keyes. Daubert caught 49 passes and eight touchdowns last season and Keyes flourished late, averaging 24.5 yards per catch. If the defense, which returns several starters, improves Warrior Run could be a playoff sleeper. Former Spartan two-way starter Adam Gehr (class of 2003) debuts as head coach tonight when the Spartans play at Mifflinburg. He is hoping to restore the luster to a program that reached the playoffs for three straight seasons prior to last fall. Hughesville has some excellent building blocks in players like running back/linebacker Jase Wright and two-way starting linemen Zane Gee and Hunter Laird. Sophomores Hunter Herr and Colton Yocum could make big impacts on both sides of the ball and there is a lot of upside for this team. Last season ended in heartbreak with the NTL-II champions losing in the last seconds to rival Hughesville and Wyalusing in the District 4 Class A semifinals. Now, the Indians are hoping to take their frustration out on opponents as they try going for a second district title in three seasons. Muncy lost some excellent players, including all-state defensive end Hunter Poust but has good starters like four-year starting quarterback Coleman Good returning. Two-way starting linemen Donovan Diehl and Larry Bilyeu are good leaders on both sides of the ball and Dylan Wilt is a big-play receiver who also has the potential to be a shutdown cornerback. A team that just missed reaching districts last season, Canton has a strong group of players back and has a chance to make some noise in the Class A field. The Warriors return a lot on offense, including all-state wide receiver Timmy Ward, Levi Gaiotti (29 catches) and quarterback Michael Smithers who totaled 2,103 yards and 19 touchdowns. Players like Ben Knapp, Sawyer Wooster and Dennis Saar could spark the defense and Canton looks dangerous if it can stay healthy. The Wildcats have really nowhere to go, but up. They struggled last season and lost the majority of their starters. That gives several young players a chance to show what they can do. Central Mountain worked hard throughout the offseason and some good playmakers like Donovan Burnell so a good foundation may be getting laid there. Speaking of teams building something, keep an eye on Milton. The Black Panthers featured an exciting offense last season that returns some good playmakers, including 2,000-yard quarterback Phil Davis and potential game-changing receiver Quaylin Rice. The defense must get better for this team to take the next step, but Milton was much more competitive late last season and could end up being one of the area’s biggest surprises in 2018. One of the area’s best feel-good stories last season, Bucktail could be even better this year with many starters returning from a District 4 Class A semifinalist. The state’s smallest public school made a four-win improvement last season and won four games despite dressing as few as 14 players at times. Three quality running backs return as does quarterback Richard Perry and cornerback Liam Dwyer who intercepted an area-high seven passes. The Bucks are definitely a team to watch in the Class A field. CV returns most of its starters from a team that was 2-3 at one point and that lost two games during the season’s second half by seven points each. Running back Matt Barber finished among the area’s top 15 rushers and receivers last season, quarterback Seth Huyler nearly threw for 1,000 yards and cornerback Thomas Shadle intercepted four passes while averaging more than 10 tackles per game. No CV team has won more than three games since the program was reinstated in 2004 but this squad could break that streak.